Ritmia is able to automatically signal the presence of episodes – also short and asymptomatic – of atrial fibrillation, often not felt by the subject itself, but that can, even for healthy people, or who believe themselves such, quintuple the risk of cerebral stroke. Stroke, in addition to being devastating to the subject, increases the subsequent mortality and is pathology with enormous costs for society. Atrial fibrillation is the most common cardiac arrhythmia, a frequent unrecognized cause of cerebral stroke. 33.5 million people are affected in the world. It is often diagnosed only retrospectively after stroke. It can be completely asymptomatic and silent, and therefore subtle. A preventive diagnosis, a necessary condition to access the modern therapies prescribed by the trusted cardiologist, reduces the risk of cerebral stroke by 70%. Continuous monitoring is needed to diagnose atrial fibrillation. Today it is only applicable through implantable subcutaneous, invasive devices that are extremely costly and can not be used on a large scale. Or using traditional tools – such as the ECG holter – which are however unsuitable for long-term monitoring. Using a standard Bluetooth heart rate monitor (BLE), the Ritmia algorithm detects the heart rate, recognizes atrial fibrillation automatically and records its presence and duration. 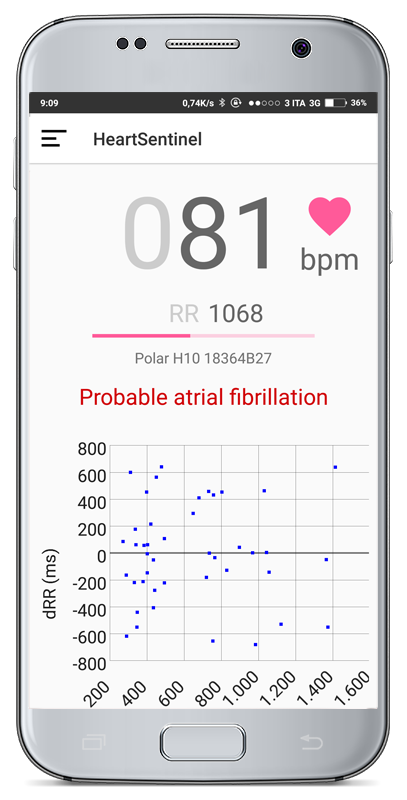 The history of the data and recordings processed, through the dedicated app, are immediately available to be controlled by remote cardiologists who can interact with the patient by sending text messages and alert messages. A project is underway for the large-scale and prospective diagnostic validation of the algorithm, which provides for the screening of almost one thousand patients at risk, by comparison between Ritmia and traditional instruments.